Give your father a well-deserved reward in the form of a fantastic dinner cruise! Come aboard the Star of Honolulu for a buffet dinner with live entertainment! Celebrate Father's Day this year aboard Oahu's premiere cruise liner. In addition to a delicious catered dinner buffet, enjoy live entertainment including hula dancers and relaxing Hawaiian music. Experience views of Waikiki Beach, Diamond Head and the spectacular Kahala Gold Coast from the top deck of the award-winning Star of Honolulu. Book now to make this year's Father's Day a truly memorable experience. Enjoy a generous dinner buffet, featuring a carving station with USDA Choice Top Round Roast as well as various entree, salad, dessert and beverage options. Dads can enjoy one Star Signature Mai Tai, complementary with the cruise! Experience a variety of live entertainment like no other, starting with the STAR’s pier-side welcome hula. During dinner, enjoy the “Polynesian Journey” show and relaxing Hawaiian music, including strolling musicians to take requests. From Waikiki (3mi, 15-20mins): Travel WEST on Ala Moana Blvd to Aloha Tower Pier. Turn left onto Aloha Tower Drive. Parking is available in front of the Aloha Tower Marketplace as well as in the larger lot located to the left past the Maritime Museum. Weekdays after 4pm and all day on weekends, you may park for small flat fee. Parking before 4pm on weekdays will accrue an hourly fee. Discounted parking validation is available with ANY purchase from ANY of the stores in the marketplace. 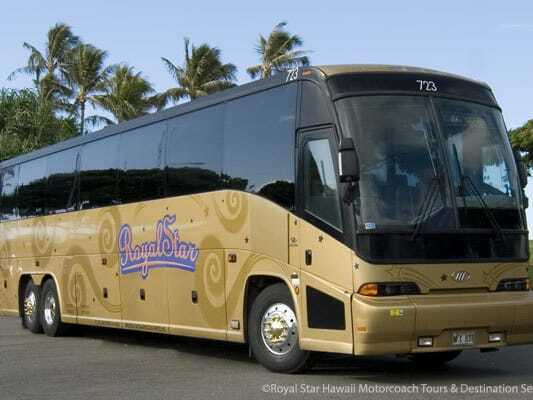 Enjoy a comfortable ride on Royal Star motorcoach. Wheelchair accessible with at least 24 hours advanced notice. Wheelchair Accessibility: The Star of Honolulu is ADA compliant. Please indicate wheelchair accessibility needs during booking to secure arrangements for transportation. Guests prone to motion sickness may want to consider taking a motion sickness preventative before the cruise. Consider bringing a light sweater or jacket, as the cabin is air conditioned. Custom built in Seattle, Washington in 1992, the Star of Honolulu was specifically designed for Hawaiian waters. This award-winning, 1,500-passenger ship is equipped with innovative watts-type stabilizers and a steady-ride deep vee hull for state-of-the-art smoothness and unparalleled comfort. The ship is also ADA compliant, with two elevators, accessibility ramps and four panoramic decks. Other features include banquet rooms, private lounges, bars and a top observation sun deck with reclining chairs.